Health and technology companies take up eight out of the top 10 brands that consumers say they’d be most proud to work for, according to YouGov BrandIndex's first workplace Reputation Rankings. Samsung was one big winner, placing on the top 10 ranking and top improvers list, while its Galaxy brand also landed as a top improver. 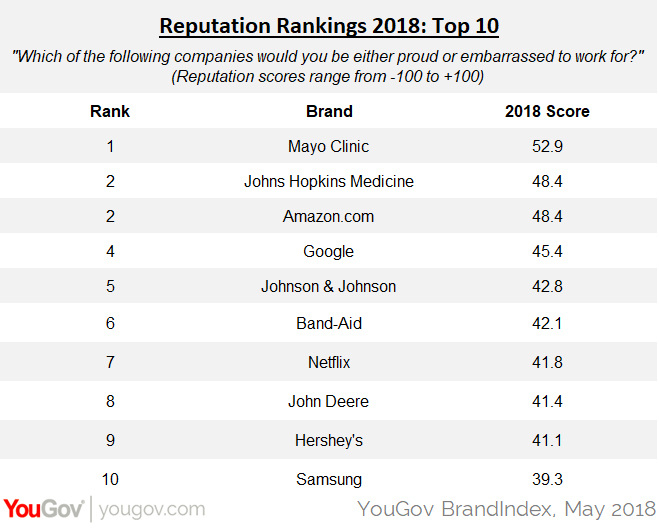 The Mayo Clinic and Johns Hopkins Medicine placed in the number one and two positions of all 1,600 brands that YouGov BrandIndex tracks daily. Johnson & Johnson and Band-Aid took the fifth and sixth spots. The four technology and online brands include Amazon (tied for second), Google (fourth), Netflix (seventh), and Samsung (tenth). It’s a particularly big leap for Samsung, which was in 27th place out of 1,600 brands this time last year. The jump likely reflects the solid product comeback Samsung took after its exploding Galaxy Note crisis the year before. Also making the Reputation top 10: machinery and vehicle maker John Deere in eighth place, and Hershey’s in ninth. 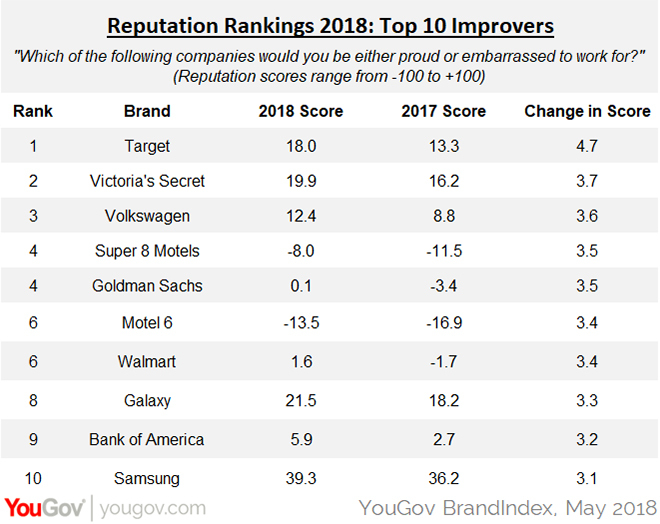 The list of biggest Reputation improvers since one year ago underscores comebacks – brands that may have had a bad rap in the past, but have recovered. Volkswagen, Samsung, and Galaxy all appear to be rebounding from their major crises in the past couple of years. Goldman Sachs and Bank of America, the perennially negative poster children of Wall Street and banking, seem to be shedding that image as well. Even Walmart, which has been subjected to many high-profile lawsuits and articles over its workplace practices in the past, is gaining traction with consumers once more. YouGov BrandIndex crunched the daily Reputation score data of its entire 1,600+ brand universe from May 2017 through May 2018. All respondents are adults 18 and over. The Reputation score asks respondents: "Would you be proud or embarrassed to work for this brand?"